What a lovely book! So many of us possess a boxful of memorabilia from ancestors who experienced similar adventures, and we wonder how to convey that excitement. Mostly, the box gets passed along, and the excitement recedes into a forgotten past. I don't remember ever seeing such a graceful and useful assembly of tickets, family pictures, stories, and recipes. Francesco Paolo Scafidi and Antonia Maria Delpopolo, the author's maternal grandparents, met "under a fig tree" in the vineyards of Castiglione di Sicilia. In 1920, just five months after their wedding, the couple left the impoverished Mediterranean island of Sicily, the most southern point in Europe, and began a journey that would take them to the unlikely destination of Rutland, Vermont in northern New England. 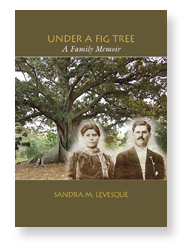 Under A Fig Tree is the immigrant's story, oft told, but with rich details and startling insights that are as nuanced as a Sicilian Sunday dinner. This is a journey that crosses oceans, national boundaries, cultures, and three generations of one family in an Italian-American community that is quietly receding into history. The book includes more than 100 photographs and a collection of Sicilian family recipes. no trace upon the soul.